The Chi-Athlete: Did You Celebrate? Some quality pool time happened yesterday morning. The roads were really slick and icy when I left at around 5:00am, so it took me a little longer than expected to get there. I had about thirty minutes to get some "back to basics" swimming drills and sets done. And as you can see, it was "pick a lane, any lane." I have a LOT of work to do on my stroke and endurance; just knowing that I can still get my booty up and at the pool when it's 20-something*F outside makes me feel better. After what seemed like a typically trying Monday for both Harry and I, I got this text message while Harry was on his way home. There was only one thing for us to do. Paired with a yummy brew. That's how we showed Monday who's boss, y'all. Harry threw some turkey burgers on the (pan, since the grill is out of commission until the ice and snow are melted off of it...hah) Sunday night, and I threw these in the oven. UM. Okay, so imagine a starchy, complex-carby, delicious BBQ-y, absolutely tasty fry in your face. That's this fry. These would seriously be perfectly paired with anything on the grill, veggie or meat. I'm actually really, REALLY proud of myself for only throwing half of the bag onto the pan to bake. We could've eaten the entire bag, no problemo. The best part is that Harry isn't a sweet potato fry guy, but he gobbled these up! And just one thing before I leave you (because I gotta run...literally). Sweet Potato Fries: Yay or Nay? -SUPER YAY! But if you aren't a fan, try the ones I mentioned! -I just finished my *first* cup of the day. 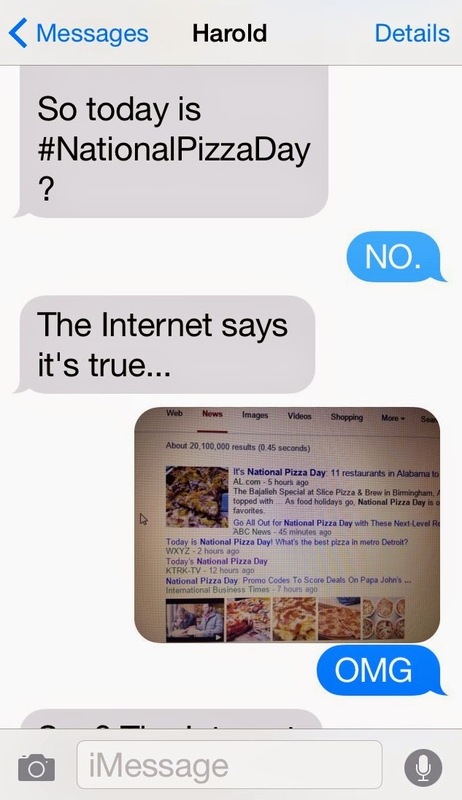 I had no idea it was national pizza day! But I did have some on Sunday night so maybe that counts? i wanted to, but had already made dinner plans! plus, the black ice sidewalks we had definitely made me want not to walk down to my favorite pizza place. Thanks for joining! Absolutely love that instagram post - so true! !